Heat oven to 350°F. Spray bottom only of 9x5-inch loaf pan with baking spray with flour. In large bowl, beat Cake ingredients with electric mixer 2 minutes on medium speed until combined. Pour into pan. Bake 55 to 65 minutes or until toothpick inserted in centre comes out clean. Cool in pan 10 minutes; run metal spatula around edge of loaf to loosen. Remove from pan to cooling rack. Cool completely, about 1 hour. In medium bowl, beat cream cheese with electric mixer on low speed until smooth. Beat in whipping cream and icing sugar on medium speed, scraping bowl occasionally, until stiff peaks form. Spread frosting over cake. Top with sliced strawberries. 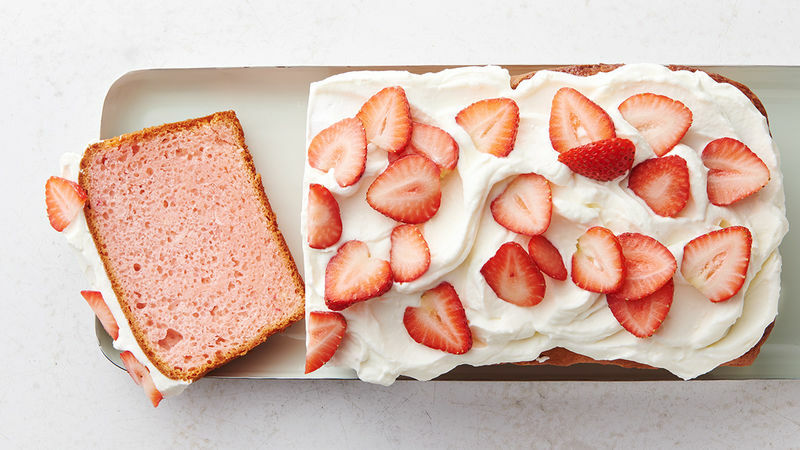 Use sharp serrated knife to easily cut this tender cake into slices.